Welcome Kathy Griffin fans! I’m not exactly sure why, but ever since I wrote my review of her performance a year ago, she is the number one search term that brings people to my web site. Well, we just saw her again tonight at the Touhill Performing Arts Center at UMSL, so I guess I can expect my site traffic to double now. It was a great show, and she said that since she was taping her new Bravo special tomorrow night she was trying out some of her new material on the St. Louis audience. We are a hometown audience for Kathy’s assistant Tom, so she has a special connection to us, which she poked fun at with references to her visit to Meramec Caverns. She also lampooned the $90,000 spent by the Miracle Theater in Pidgeon Forge, Tennessee, on a full-page ad in USA Today denouncing her and her Emmy acceptance speech. As she pointed out, she is glad that money was spent wisely, and not wasted feeding the homeless, or something. Fans of her show will no doubt remember her bombing during a fundraiser in front of a jewelry makers convention. She told a outrageous story about that gig that never made it to television because it was deemed “to horrible” by Bravo producers. She also ripped on Fox’s Bill O’Reilly and his sexual harrassment lawsuit. She encouraged the audience to go home and Google for “Bill O’Reilly” and “loofah” and promised us that we would be glad we did. Fantastic show. 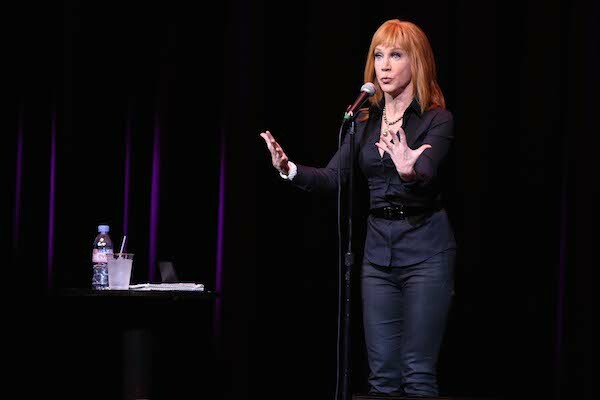 Kathy is such a great live performer and her self-deprecating humor and irreverance for everything make her a star in the business, even if she is only D-list.